it’s been a christmas tradition for me for the last 5 years to turn my kitchen into a disaster and make about a hundred of these little delights. they are beyond fun to make… i mean who doesn’t love simmering caramel and melted chocolate to get messy in. and noone is sad to find a broken pretzel in the bag because those turn into the “reject” pile for quick consuming. i had to include the recipe of the caramel because its foolproof. it turns out perfect every time. Boil the butter, brown sugar, sweetened condensed milk, and Karo syrup for 5-7 minutes. Remove from heat and add the vanilla. so you dip the pretzel rod into the caramel and lay on parchment paper to cool. then you melt down almond bark (chocolate) mixed with a little oil (thin it out a bit). now dip the cooled caramel pretzels into the melted chocolate and let it cool. decorate as you wish and package them up pretty and stand back as you hear the raving reviews of what tastes like homemade twix bars. 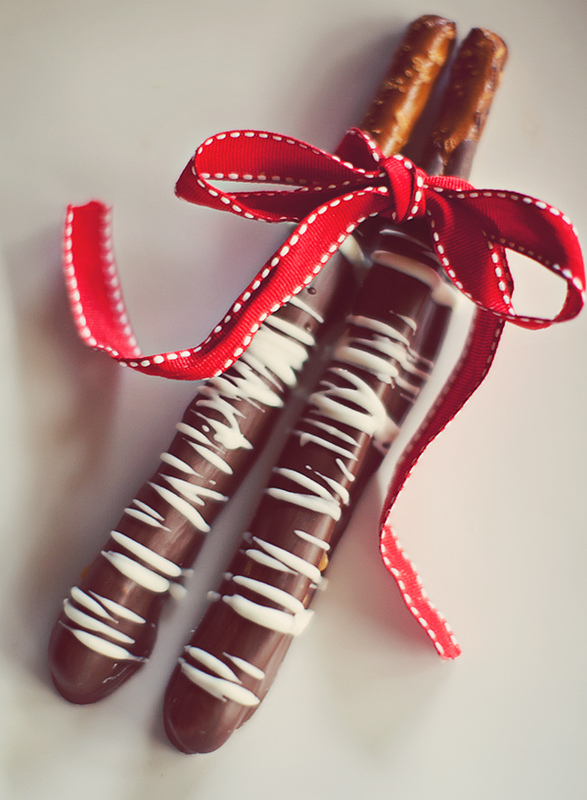 I LOVE chocolate covered pretzels! I didn’t have time to make any this year, but you are making me want to make some right now! Yum, can’t wait to make this the kiddos. oh my goodness, that looks wonderful! Silly question, how much butter is a cube of butter?